Manchester City boss Manuel Pellegrini says his side's shock 2-1 FA Cup defeat by Wigan will not damage their chances of winning more trophies this season. The Capital One Cup winners are nine points behind Premier League leaders Chelsea with three games in hand. They also trail Barcelona 2-0 going into the second leg of their Champions League tie on 12 March. "We have won one trophy and we have a lot of things to fight for until the end of the season," Pellegrini said. "First we must win in Barcelona on Wednesday and then try to go top of the table with our three games in hand." City struggled to find their rhythm against a well-organised Wigan side, who advance to Wembley to continue their spirited defence of their trophy against Arsenal in next month's semi-finals. 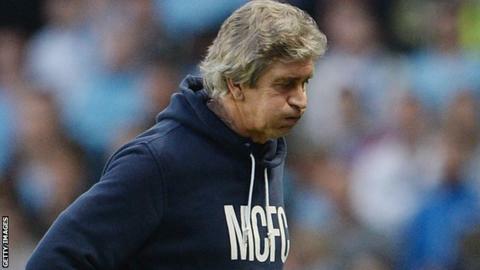 "I think we played the worst first half we have done in my time here," added Pellegrini. "We did not have the pace we needed against a team with Wigan's intensity." Jordi Gomez put the Latics ahead from the spot and James Perch doubled their lead after half-time, while it was only in the last half-hour that City began to create chances. "We only reacted in the last 35 minutes. We scored one goal and we had at least three or four more chances to score more," said Pellegrini. "But if we do not have the same intensity as these teams then it is very difficult to win. We knew we were playing a difficult team. "It is very difficult to say that we were unlucky, but we at least deserved a draw. We had three or four chances to score but it was too late."